I went to put in a call to a web design client in Cincinatti, OH (area code 513) and instead dialed 315. Probably because 315 is familiar to my mind as I grew up in NY in that area code. Anyhow, the person on the other end answers the phone and he sounds just like someone I grew up with. Apologized for the wrong number and tried my number again, getting the same guy. I realized after he told me I was dialing 315 what was going on but I was still stuck on the fact that he sounded just like someone I used to know. Turns out he IS someone I used to know. A close childhood friend. We started chatting a bit and caught up with each other. How strange is that? Small world. In other news, I've been meaning to post the pictures from my 32nd birthday party. 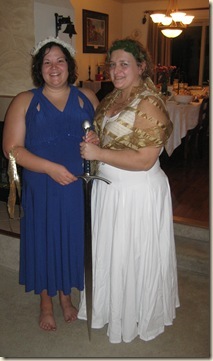 The theme was "Ides of March" and everyone dressed in Roman costume. 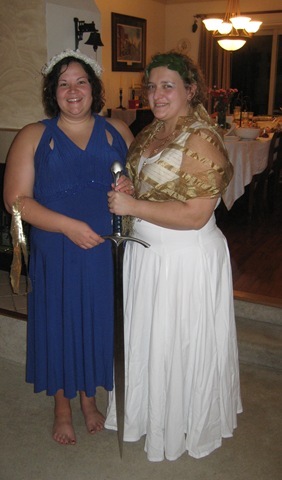 Here is my favorite picture- my best friend Anna and I standing at the ready. great pic my friend and its amazing that you got in contact with an old friend. GOD can do great things!!!! That is awesome about the friend!